Discovered 1779 by Pierre Méchain. Messier 63 (M63, NGC 5055), nicknamed the Sunflower Galaxy, is a beautiful spiral galaxy in the constellation Canes Venatici. 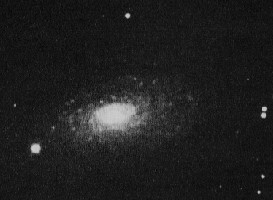 M63 was the very first discovery of a Deep Sky Object by Charles Messier's friend, Pierre Méchain, who caught it up on June 14, 1779. On the same day, Charles Messier included it in his catalog. The Sunflower galaxy M63 is one of the early recognized spiral galaxies, listed by Lord Rosse as one of 14 "spiral nebulae" discovered to 1850. It has been classified as of Hubble type Sb or Sc, displaying a patchy spiral pattern which can be traced well to the periphery of its only 6 arc seconds small smooth-textured central region. Although 6 degrees south, it apparently forms a physical group with M51 and several smaller galaxies, the M51 group, which is about 37 million light years distant. The visual appearance resembles the photo: The spiral arms show up as a grainy background, which brightens slowly from outward and then rapidly to the nuclear region, which is still grainy. Star forming regions can be traced all along the spiral arms on color photos. Type I supernova 1971I occured on May 25, 1971, and reached mag 11.8.